There seems to be a fairly dramatic shift among small businesses with regard to the money they spend on customer acquisition. For the first time, according to a new study, small businesses are spending MORE of their time, money, and resources on strengthening relationships with existing customers rather than acquiring new ones. Previously, small business owners prioritized customer acquisition over customer retention at a 7 to 1 ratio, reported BIA/Kelsey, the research firm that has studied small businesses. But in the new study conducted for Manta, an online community for small business, 61 percent of small business owners surveyed report over half of their annual revenue comes from repeat customers rather than new customers. A repeat customer spends 67 percent more than a new customer. Only 14 percent of small businesses surveyed are spending the majority of their annual marketing budget to acquire customers. According to Manta, "This is a significant shift in behavior as small business owners have realized that existing customers play a more influential role in business success than new customers." Obviously, small businesses shouldn't abandon new customer acqusition, since customer attrition is inevitable and new customers need to supplement and replace the old. Still, it makes a lot of sense to invest in existing customers -- they cost less to retain than acquiring new customers, and they are worth more in the long run, both in terms of ongoing business and referring other customers. Brand marketers would do well to consider starting a blog or keeping an existing blog current. A new survey indicates the majority of American consumers (62%) wants to see content directly from their favorite brands. Nearly half of respondents (46%) read blogs published about their favorite brands. In addition, 40% of consumers prefer to read content published in a brand/company blog instead of a news magazine or website. Nearly half (48%) of consumers believe it is important for brands to create content on blogs for reasons including providing consumers with the most up-to-date information, giving consumers a more personal connection with the company, and giving brands a voice. Forty percent of consumers believe there are negative effects if brands do not create content on their blogs. Before you put all your eggs in the social media basket, you should also note that 52% of consumers prefer to go directly to a company website for content about a brand, while only 25% go to social media. You can learn more about this survey here. 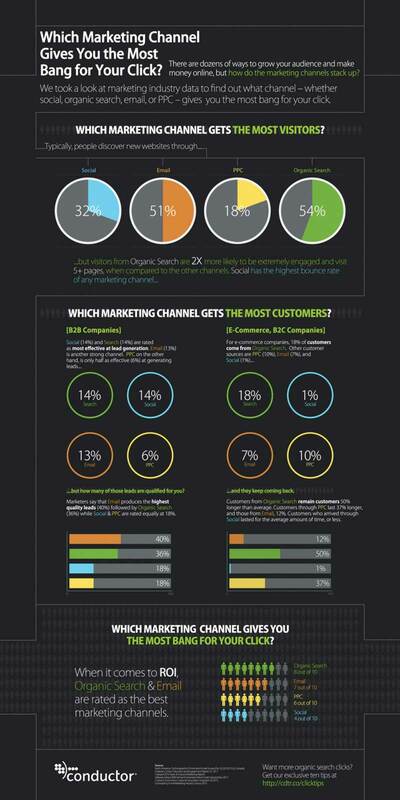 The latest statistics about the effectiveness of online marketing channels may surprise you. When comparing social media, email, pay-per-click advertising (PPC) and organic search, it is organic search that proves to be most effective. Organic search also comes out on top in terms of marketing ROI. Email ranks second.